Evidence of supersymmetry — the idea that every particle has a “super partner” with similar properties in a quantum dimension (according to some physics theories, there are hidden dimensions in the universe) — could crop up as early as 2010. Today, after over fifteen years of planning, construction, delays and drama, the Large Hadron Collider began doing what it was built to do: colliding particles. Now that the LHC is finally working, physicists will once again press forward in their search for new particles and new physics beyond anything that’s seen today. 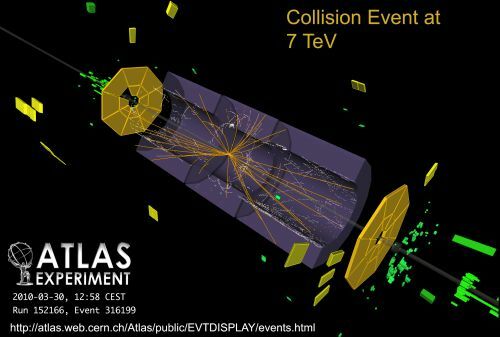 CERN has announced that the first attempt to collide protons in the Large Hadron Collider at the record energy of 7 TeV* (3.5 TeV per beam) will take place on March 30. 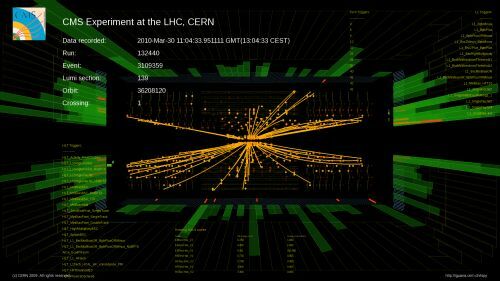 A live webcast will be available on the day dubbed “LHC First Physics” from 8:30 a.m. to 6:00 p.m. Central European Time (2:30 a.m. to 12:00 p.m. Eastern time). 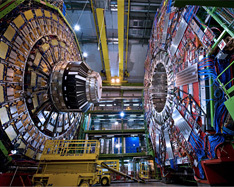 More information about the webcast will be available soon at the LHC First Physics Web site. 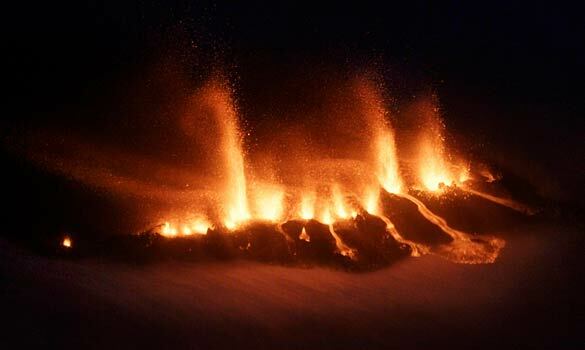 A volcano at Eyjafjallajoekull in south-central Iceland continues erupting, raising fears among Icelanders of eruptions under glaciers, which would present a danger of flooding from melt-water…. Scientists keeping measurements say the activity is strengthening slightly. We’ll keep watching. Sand particles from the storms have been reported dimming the sun as far away as the North American West Coast. With the recent eruption of the volcano Eyjafjallajokull in Iceland, climatologists and geologists are getting worried. You see, whenever Eyjafjallajokull erupts (it had been dormant for 500 years), fellow volcano Katla follows. Katla, located under a giant sheet of ice called the Myrdalsjokull icecap, would cause problems on a global scale should it erupt. Iceland’s volcanoes have serious consequences when they blow, thanks to Iceland’s position on the Jet Stream, which controls global weather patterns. So how bad might it get? When the Laki volcano erupted in 1783, it caused a cloud of poison gas to drift to Britain, where hundreds died. The smog and ash caused famines in Western Europe. Crop production plunged. The winter of 1784 was one of the coldest in history, with the Mississippi River freezing as far south as New Orleans. The last time there was a major eruption in Iceland, flooding followed within minutes of the hot lava hitting the glaciers, with house-sized boulders tumbling down mountains. Pompeii was nothing compared to what might happen when Iceland’s volcanoes wake from their long slumber. The whole world is going to know when that happens, no question about it. It’s only a matter of time. Blasts of lava and ash have shot out of a volcano in southern Iceland and small tremors have rocked the ground, a surge in activity that has raised fears of a larger explosion at the nearby Katla volcano. Scientists say history has proven when the Eyjafjallajokull volcano erupts, Katla follows – the only question is how soon. And Katla, under the massive Myrdalsjokull icecap, threatens disastrous flooding and explosive blasts. Saturday’s eruption at Eyjafjallajokull – dormant for nearly 200 years – forced at least 500 people to evacuate. Most have returned home, but authorities were waiting for scientific assessments to determine if they should stay. Residents of 14 farms nearest the site had to stay away. Several small tremors were felt early on Monday, followed by spurts of lava and steam rocketing into the air. Iceland sits on a large volcanic hot spot in the Atlantic’s mid-oceanic ridge. Eruptions, common throughout Iceland’s history, are often triggered by seismic activity when the Earth’s plates move and magma pushes its way to the surface. Iceland’s Laki volcano erupted in the mid-1780s, freeing gases that turned into smog. 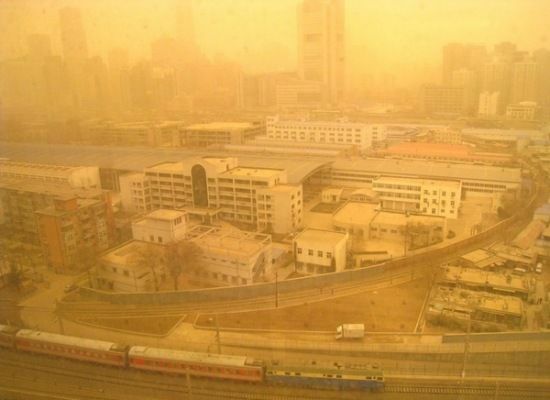 The smog floated across the Jet Stream, lowering temperatures and changing weather patterns. Many died from gas poisoning in the British Isles. Crop production fell in western Europe. Famine spread. Some even linked the eruption, which helped fuel famine, to the French Revolution. Russell said past Katla eruptions have caused floods the size of the Amazon and sent boulders as big as houses tumbling down valleys and roads. The last major eruption took place in 1918. Floods followed in as little as an hour. Those eruptions have posed risks to residents nearby, but most of Iceland’s 320,000 people live in the capital, Reykjavik, the western part of the island. The last time there was an eruption near the 160sq km Eyjafjallajokull glacier was in 1821, a “lazy” eruption that continued two years. The Hurva synagogue was reopened officially on Monday after five years of reconstruction. 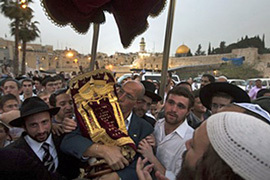 Israel stepped up security in occupied Jerusalem as Jews gathered for the reopening of what they consider as one of the most important Jewish places of worship. The synagogue, first built in 1694, was first destroyed in 1721 and then blown to pieces in the 1948 Arab-Israeli war. The walled Old City is at the heart of the Israeli-Palestinian conflict, which makes the reopening of the synagogue controversial. Qader and another senior Fatah member had called upon Israeli Arabs to go to al-Aqsa site and protect it from Israel… thousands of police and border guards were deployed across the Old City. “Considering the risk of trouble, we maintain the state of alert and restrictions on access to the Temple Mount,” Micky Rosenfeld, the Israeli police spokesman, said on Monday. Jerusalem (CNN) — Israeli Defense Minister Ehud Barak has ordered the army to seal off the West Bank for 48 hours and tightened security around the old city of Jerusalem, Israeli officials said Friday. 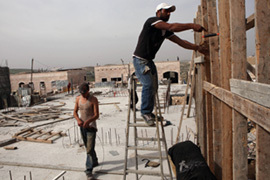 The closing of the West Bank follows Israel’s controversial announcement this week that it plans to build 1,600 new apartments on land in Jerusalem claimed by both Israel and the Palestinians. Medical workers and patients, religious workers, teachers, humanitarian workers, and journalists will still be permitted to enter and leave the West Bank, the IDF said. Police spokesman Micky Rosenfeld said there was extensive deployment of police in largely Arab East Jerusalem in order to prevent the development of riots. 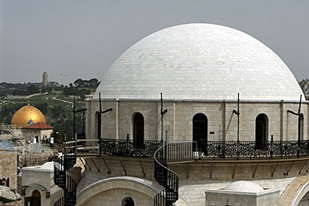 Worshipers younger than 50 and women of any age were not being allowed to attend Friday prayers at the Al Aqsa mosque, one of the city’s holiest sites, Rosenfeld said. Police were stationed at a number of points around the compound known to Jews as the Temple Mount and to Muslims as Haram-al-Sharif, police said. Despite what some have been saying, there is no scientific evidence of increased frequency or severity of devastating earthquakes in recent decades. More people are building in earthquake zones, however, plus increased detection and reporting of those that do occur. Bible passages don’t say the frequency of major disasters will increase – just that they will occur, they will mark the “beginning of the end,” and that we should be on watch. Thus this blog. Here’s an interesting article. 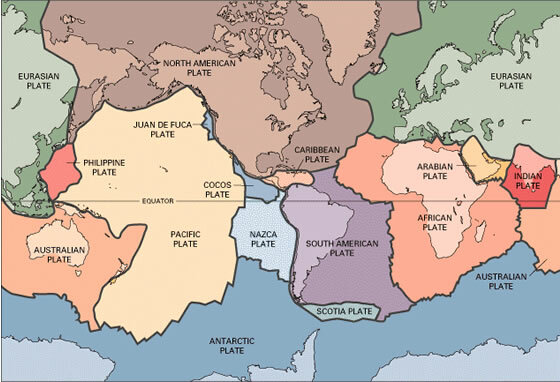 Geologists have a logical term for the recent rash of devastating earthquakes around the world: They’re called clusters, and scientists recognize that such groupings do occur. For Californians, the cluster seemed to start with a magnitude 6.5 quake outside Eureka on Jan. 9. Then a magnitude 7.0 earthquake devastated Haiti on Jan. 12. A similar-size quake struck Japan on Feb. 26, followed the next day by a powerful magnitude 8.8 temblor rocking Chile. A magnitude 6.4 earthquake hit Taiwan on March 4 and a magnitude 6.5 earthquake struck Indonesia the next day. Then, on Monday, a magnitude 6.0 earthquake shook Turkey. Despite the unnerving series of recent quakes, it’s not a sign that more seismic havoc is imminent. Although large earthquakes are capable of triggering faraway temblors, the subsequent quakes are typically well under magnitude 4, geologists say. So when major earthquakes occur close in time but thousands of miles apart, it’s considered coincidence.